Fairfield Porter (1907-1975) was one of the most intriguing painters and insightful art critics of the American 20th century. Born fourth into an affluent and self reliant family of high intellectual and artistic activity (his older brother Eliot became a famous photographer), he did not display much artistic talent as a youth. Even so, he decided on an art history major in his second year at Harvard University (which he entered at age 17), where he studied under Arthur Pope. After an extended European tour in 1927 he studied under Thomas Hart Benton and Boardman Robinson at the Art Student's League in New York City (1928-31), and was influenced by acquaintance with Alfred Stieglitz and the works of John Marin. He spent most of 1931-32 in Italy, developing an eye for Italian art from the greatest living authority of the time, art historian Bernard Berenson, and from close firsthand study in many museums and galleries. On his return he married the poet Anne Channing, and spent the next two decades slowly learning the craft of painting, providing artwork for many socialist organizations, and struggling to find care for his autistic son. He was impressed by a 1938 exhibition in Chicago of paintings by Edouard Vuillard (1868-1940) and Paul Bonnard (1867-1947), but the greatest influence on his work came from the abstract expressionist Willem de Kooning (1904-1997), whose work Porter was first to acclaim. The Porters spent most of the Great Depression living in Chicago on funds from a family trust, but after the death of his father in 1939 they moved back to the suburbs of New York City, then the City itself, where Porter worked during World War II on Navy projects for an industrial designer. He enrolled for two years at the Parsons School of Design (1945-46), taking painting lessons from a former Louvre restorer, and began writing occasional art critical pieces for Partisan Review (then edited by Clement Greenburg). The Porters moved to Southampton (Long Island) in 1949, though Porter spent several days each week visiting galleries or working in his studio apartment in New York City. He was hired as an art reviewer for Art News (from 1951-59), and the year after began a long series of nearly annual one man shows (from 1952-1970) at the Tibor de Nagy Gallery. His critical writings were always based on a direct response to an artist's works, without personal bias or preconceptions; he consistently criticized "talk based" art criticism that evaluated art in relation to its past or a theoretical agenda, or attempted to dictate the future direction of art like "a totalitarian party on the way to power." He became art critic at the The Nation in 1959, but quit this post in 1961 to paint full time. He continued to expound his critical ideas and teach a new generation of painters through positions as guest instructor or lecturer. His paintings were shown in six Whitney Museum annual exhibitions from 1959-68, and he was one of ten artists representing the United States at the 1968 Venice Biennale. Although well known among New York representational artists, Porter was also a poet and friend of poets such as John Ashbery, Frank O'Hara and James Schuyler  Porter's occasional lover, longtime house guest and most perceptive critical supporter. Porter died of heart failure in 1975, during an early morning walk along the ocean, at age 68. Porter's father acquired the tiny Great Spruce Head Island off the coast of Maine (near Rockland) in 1912, and built there a large summer house of his own design with gable windows, a barnlike family room and two big screened in porches. This became the venue for almost annual family summer retreats and, as the Porter child with the largest family (five kids and a large circle of friends and houseguests), Porter took control of the Big House after the death of his mother in 1946 and occupied it nearly every summer from 1954 until his death (his siblings Nancy and John built houses of their own nearby). 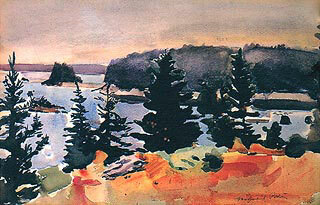 Maine  Toward the Harbor (1967, 30x48cm) is immediately familiar in Porter's works as one of the many views from the spruce covered height of this family island. Porter often climbed this hill to make landscape studies, whose exact location and direction of view can always be identified by the unique pattern of shoreline and islands scattered on all sides. This painting is Porter at his best. The apparently loose brushwork diverts us from appreciating the balanced variety in textures (from the wash sky to the wet in wet color mixtures of the foreground) and the exact control of color edges, which evoke bright light by leaving white borders around the lefthand trees. Porter emphasized in all painting the concept of value, which was not simple light and dark (which he referred to as chiaroscuro) but the quality of a color in context. This was the touchstone of Porter's artistic instincts, and is the reason his landscapes focus on unique harmonies of light and atmosphere. Many of Porter's paintings (especially of people) have a curious quality of suspended movement, as if subject, color and paint are all holding their breath in order to make the light in the canvas more visible. The craft of Porter's mature style consists in its apparent simplicity. The matter of factness in his paintings serves both to hold representation at arm's length, so that we don't take it for granted as "what we are looking at," and to make the behavior of paint as important to our attention as the subject and composition. As a result, perspective depth is often weakened (so that the painting surface is preserved), and the background is as visually important as foreground objects. 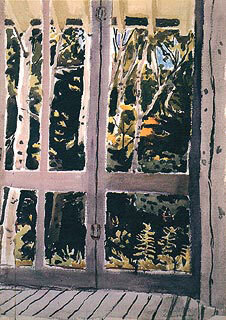 The Door to the Woods (1971, 71x58cm) presents another setting familiar in Porter's works  one of two screened wooden porches in the summer house in Maine, which opened toward the hillside woods and served as Porter's studio. Porter has simplified the design to contrast the linear porch framing with the random tangle of leaves outside; the slim birch trees provide a lovely transition, and the peek of blue sky sets off the woodsy yellows and greens, and the rose gray shadows indoors. Although there is a full range of tonal values, these are subordinated to the different planes of the picture. The vertical pattern of the birch trees nicely plays against the parallel door jamb and the curvy crack wandering up the righthand wooden post. We easily see the foliage as outside the porch but rely on the dark color rather than the perspective cracks in the floor to do so. The eye is led outside by the gradual increase in luminosity  from the inside floor boards to the creamy eaves, out through the brush tangled trees and into the sky. There is a wonderful airiness to this cramped view, a reserved yet nostalgic quality of light that is unique to Porter and the hallmark of his best works. Porter's seemingly mundane painting choices were motivated by his vision of what art should be. His many portraits, for example  made in an era in which portraiture was considered hack work or a dead genre  are both paintings of cherished friends and icons of the painting itself as a unique, individual object. In several late paintings, Porter delighted in showing the remnants of a meal scattered across the surface of a table. In Still Life (1975, 57x77cm), Porter wants to show us the humble objects of daily life as having value in themselves; in the same way he valued his friends and family, and the domestic spaces of his two homes. Seen in the context of the bathetic art preachings of Clyfford Still or Barnett Newman, this painting is radical because it claims to show us nothing more than clutter. Porter's deepest concern at this stage in his life was to declare the difference between the values of art and of technology. These may be common plates, packages and chairs  possibly generic products from a mass outlet store  but their skew and scatter here is the result of a unique breakfast touched by unique hands, which is now past and will never be repeated in exactly the same way. This tableau of chaotic life is played against the abstract, vertical pattern of the near windows, which express a scientific rigidness, cold and impersonal, reticulated like an oversized graph paper that measures out the empty reflections of the silhouetted screen porch opposite. By transforming this sterile pattern into the shimmering and elusive reflections of light on the table, over which the round dishware and bright blossoms float like petals on a stream, Porter gently states his love of humble life lived in the moment. Watercolors were an integral part of Porter's artistic growth and vision. As he grew into his mature style, his wife Anne observed in 1947 that "now some of the freshness and mystery that he had in watercolor is coming into his oil paintings too." Porter wrote the same year that the effects he sought were what "I had been doing inarticulately in watercolor, but not in oil"; and much later (in 1957) he reiterated that "for me painting should aspire to the condition of watercolor." At the beginning and toward the end of his life, watercolors were his preferred medium. It is therefore disheartening to see the most lavishly produced monograph on Fairfield Porter entirely omit consideration of his works on paper, and relegate most watercolors to marginal black and white reproductions. The operating consensus among contemporary art historians (including the author of that monograph, John T. Spike, a specialist in baroque Italian painting) is that a painter's development and influence can be traced entirely through works in oil  the oil pipeline of the museum and gallery cash economy, to be blunt about it; compared to oil, works on paper are mere compost. 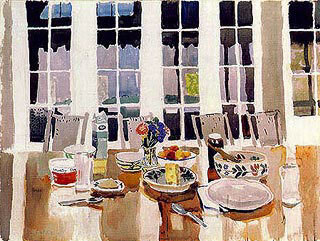 Until his watercolors have been adequately documented, intelligently critiqued, and integrated with his artistic personality, Fairfield Porter's unique sensitivity to paint and light, his difficult evolution away from muted palettes, his mature method of blocking in paintings with large areas of diluted color, and his continuous effort to balance pictorial detail with broad effect  all will remain largely misunderstood. The only available collection of Porter's watercolors is the slim gallery catalog Fairfield Porter, 1907-1975: Watercolors by Frank Del Deo & Betty Cunningham (Hirschl & Adler Modern;, 1995), which contains 13 good quality color reproductions. The maligned monograph is Fairfield Porter: An American Classic by John T. Spike (Harry Abrams, 1992), a work commissioned and guided by Porter's wife; Spike hews to a sanitized biographical text, and offers many beautiful reproductions of Porter's oil paintings but scant comment on the artistic issues they reflect. Far better as biography is Justin Spring's Fairfield Porter: A Life in Art (Yale University Press, 2000), which lacks a representative selection of Porter's paintings but traces his personal and artistic growth in depth. The best resource for Porter's complete works is Fairfield Porter: A Catalogue Raisonné of the Paintings, Watercolors, and Pastels by Joan Ludman (Hudson Hills, 2001). Shortly after Porter's death, the British painter Rackstraw Downes compiled an engrossing collection of Porter's critical reviews and art writings, Art In Its Own Terms: Selected Criticism, 1955-1975 (Zoland Books, 1993), and down through many reprintings this is still the best introduction to Porter's maverick and relentlessly trenchant critical mind.